Vi trovate su: Home / How to increase your hotel’s presence on Google? How to increase your hotel’s presence on Google? Your meta description in most case (2 lines of text in Black). However, your hotel can also have a presence on many other Google product and/or have a more elaborate and predominant ads (free or paid). To have your hotel showing on sponsored linked, you first need to have a Google AdWords account. Google shows sitelink when he thinks he can save its users time to reach right content. For the time being this process is automated and Google does not always show most logical results. Therefore, Google offers a solution to demote some links within your sitelinks thanks to Google Webmaster Tools. 1. Within left menu ” Site configuration”, click on Sitelinks. 2. 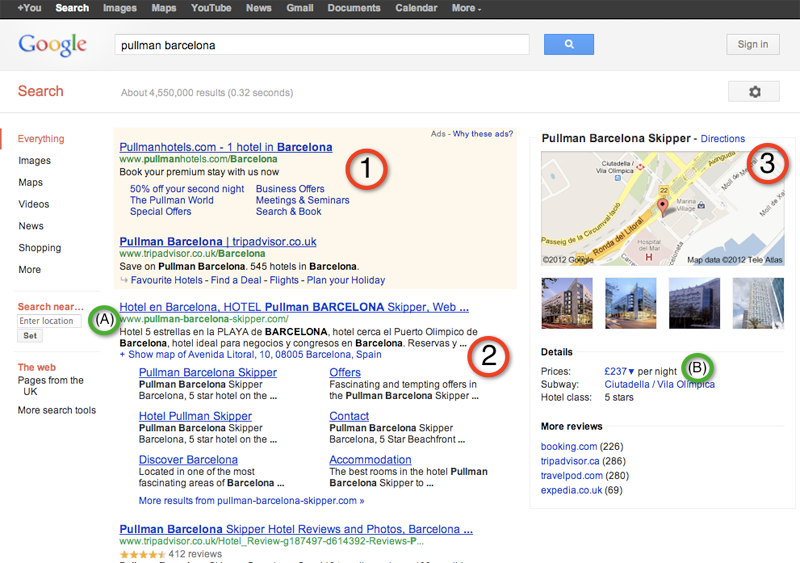 In the “For this search result” box, enter the first URL showing on top (A) as on our example www.pullman-barcelona-skipper.com. 3. In the Demote this sitelink URL box, complete the URL of the sitelink you want to demote. Comments: Sitelinks are generated for your main pages. Therefore one website can have several sitelinks generated for its most important URL’s. Most common is to have the URL in position (A) changing in relation to language of your site. Therefore, this organisation between “For this search result” and “sitelink URL” enable you for example to demote URL language by language. Google webmaster tools allow you to demote up to 100 URLs. Demotions are effective for 90 days from your most recent visit to the Sitelinks page in Webmaster Tools. One of the key component to optimise your listing is to make sure that you hotel is listed on all directories, social media and OTA’s with the same Hotel name, same localisation on maps and exact same address. This standardisation will help Google to agregate information about your hotel. More it will notice that many websites speak about your hotel more he will consider you as THE important hotel in your destination. 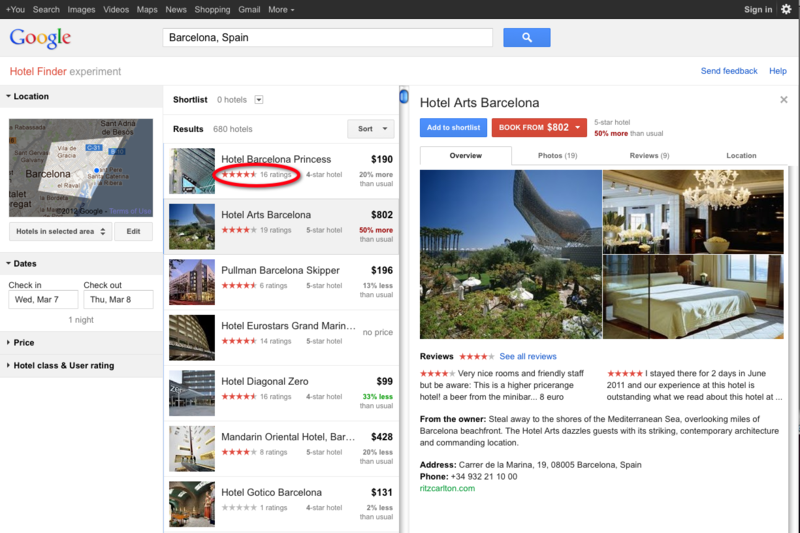 Google is now showing rates your hotel can be booked on specific dates. See (B) on screen shot. Google Hotel Finder has been launched on Beta and is available only in English. It has changed the game at least for all the Meta search Engine (Price comparison website). They have been penalyzed with Google Panda on organic results as it seems Google think he can do a better job that those price comparison sites. So far, Google Hotel Finder shows ratings and reviews only from Google user, even if it shows also on the left rating from other OTA’s or review website like tripadvisor. Type your destination and check at the bottom who is providing business listings. If your hotel is localised in one of the 4 countries below, it will need to be listed on corresponding directory. It’s not specified in France, United Kingdom, Portugal, The netherlands, Belgium, Sweden, Finland, AustriaDenmark, Switzerland.